Training is our speciality! Please read over our Commonly Asked Questions below, and the following resources. See how we're with you every step of the way. Many common questions are broken down to video format. We've been building ecommerce businesses since 2007! We are happy to set up a free consultation to review your questions in detail. Pure-Ecommerce builds and sells ready-made ecommerce businesses in a box. We create a great domain name, design a site around it, travel to the trade shows across the US and establish relationships with the vendors. We then load up all the approved products, do some initial search engine optimization work and then sell the site. Once we sell the site, we work with the client to ensure they feel confident moving forward. Pure-Ecommerce provides a 40 hour step by step ecommerce consulting and training program. During the consulting process we go over every area we know you need to be trained in to run a successful ecommerce business. During this consulting process we take you step by step through every aspect of setting up, running, and then growing your online business through a very methodical 10 step training program. We also offer custom website packages. This is where you come to us with your idea or concept and we take your idea from conception to completion. We essentially build for you a complete ready-made business in a box based on your idea. How long has Pure-Ecommerce been in business? Since January of 2007, Pure-E has been helping individuals become ecommerce entrepreneurs. What is a ready-made website or a business in box? A ready-made ecommerce business is a business in a box. Pure-Ecommerce designs and builds the website. Each site is created around a different theme and targets a different niche market. We then contact the vendors and establish the relationships. Once the relationships are established we load up the products onto the site. Once the site is loaded we begin our search engine optimization work. Essentially, we create a complete business in a box, ready to turn over to the client. Once purchased we then work one on one with the client taking them step by step through every aspect of setting up, running, and then growing their site. So you receive a complete website ready-made along with a personal mentor to hold your hand and teach you along the way. What is a custom website versus one you currently have for sale? With a custom website you’re more involved in the process, which means more work on your end. With that said, you will get to dictate your design, choose your vendors and choose your products. If you purchase one of our ready-made internet businesses for sale, you’re very close to being ready-made. Depending on where the site is in terms of completion, you can be up and running in 2-3 weeks. Also, Google loves time and our business in a box sites have been sitting for a while earning rankings in the search engines. As you can see, some of our sites have page ranks of 1 and up, so this is an added bonus. If you do a custom site you’re starting from scratch with the search engines and it will take some time to build up your rankings. On the flip side, doing a custom costs less money, and you can dictate how you want the design completed and play a role in the vendors chosen for the site. We are happy to help determine which option is best for you. What if I like several of the businesses and can't decide which route to go? Pure-Ecommerce offers a free consultation. During this period we review your site choices and give you feedback and suggestions on a good internet business for you based on your lifestyle, availability, background, and passions. To schedule a free phone consultation, simply contact us. Do I need to have any experience running an internet business? No, we teach from a very basic level. We expect that our clients have little to no experience running an internet business. 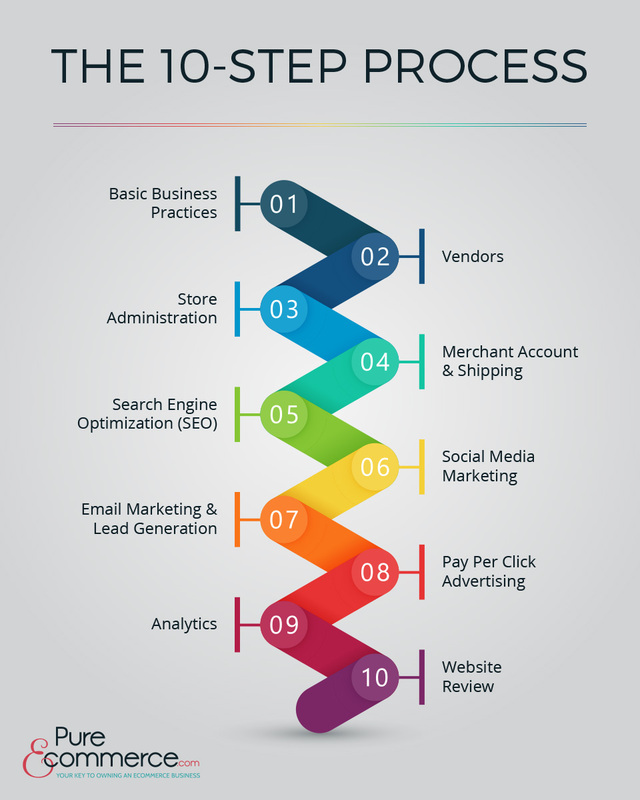 The Pure-Ecommerce 10 step consulting and mentoring process will take you through every aspect of owning and running your new ecommerce business. Do I have to carry inventory? No, all of our sites carry drop shipped products, which mean you hold no inventory. All of your products are shipped directly from the manufacturer. We acquire our vendors by traveling to trade shows across the US and establishing relationships with them for you. Once the site is yours, you are able to add or delete products on the site as you see fit. We do build businesses that can carry inventory as well. Can I carry inventory if I want or in the future add inventory? Absolutely, you can add inventory anytime to any Pure-Ecommerce internet business for sale. You could consider adding inventory down the road once you start producing an income or you can simply stay a drop ship internet business. Can I remove product or add new lines? Yes, our hope is that you will continue to grow your business by adding new product lines. During step 3 of the consulting process, the vendor step, we go over how to deal with, find and contact vendors. We teach you how to go about finding new vendors so you will be equipped with the knowledge on how to grow your business. Remember, once you purchase the site, it is yours. You can add, take away, or move around products as you see fit. How does the consulting work? With each Pure-Ecommerce site, you will receive up to 40 hours of ecommerce consulting. Pure-Ecommerce works one on one with you taking you through every aspect of setting up, running, and growing your online business. We do so through a proven 10 step training program. The mentoring process touches on every area a first time online business owner needs to be proficient in to run a successful ecommerce business. It is our goal to help you become an online business success. Consultations are done via the phone, email, and instant messaging. We work at your pace during the consulting process. You will also have access to our eLearning Library. In the library, you will be able to check your steps, additional learning materials, resources, webinars, etc. By having this access it allows you additional training that you can do on your own. What is included in the eLearning library? All clients who purchase a site which includes our consulting package will receive access to the Pure-Ecommerce eLearning library. The eLearning library houses the 10 Step Instructional Program. Each step includes support documents with helpful content, links and videos to assist our clients as they work through each step. In our Step 1 process you will receive your log-in information which will enable you to access the library 24 hours a day, 7 days a week. This is a convenient way for our clients to access the learning documentation on their own schedule while working through the Pure-Ecommerce 10 Step Process. Our consulting clients will have access to the eLearning Library for one year as they work through their 40 hours of consulting time. Our consulting clients will have access to the eLearning Library for one year as they work through their 40 hours of consulting time. You may also purchase additional access to the elearning library or consulting when you need it. Pure-Ecommerce updates the content in the eLearning Library as information in the ecommerce industry changes. We use the eLearning Library as an outlet to provide our clients with the most recent information and tutorials as they pertain to the most recent advancements in ecommerce, marketing and search engine optimization (SEO). What are the markups on your product lines you acquire? Most of the products have 100% markups, sometimes slightly more, sometimes slightly less. The margins depend on the area of trade you enter into. Pure-Ecommerce attends trade shows across the US and chooses product lines that are trendy, stylish, and highly sought after. Most of our products are very celebrity driven. We encourage you to ask us directly what the margins are for the particular industry you have interest in. Can I change the pricing? Definitely! One of the immediate tasks Pure-Ecommerce suggests you tend to after you purchase your ready-made website is to analyze the pricing. You need to request pricing info from each of your vendors and compare it to the pricing you have on your site. Make sure it fits with your business plan. What if I decide to do a custom website-how long does that take to build? It usually takes between 8-10 weeks for Pure-Ecommerce to complete your site. The consulting process is done at your pace. You have up to 12 months to use your consulting time. If you need more time an extension can be written into the agreement. Once I purchase a business in a box ecommerce site, can I change things on the website? Once you purchase your site from Pure-Ecommerce, you can change, delete, move around, and add to the site as you see fit. The site is completely yours and you can do whatever you desire. However, we do suggest you consult with us on any major changes. What can I expect my monthly costs to be? Who maintains the site after I purchase? You do, and Pure-Ecommerce gives you the tools to do so. During the consulting process we teach you how to work the back end, check orders, add categories, add content, add pages, etc. The only area we don’t consult on is web design. We do not go over coding, how to design sites, how to change the design on your site, etc. You will need a web designer to do this part. We do have 3 designers on staff that can help you for an additional cost. You will find it is very easy to work the back end. That is why we choose this particular cart. It’s very user friendly and extremely easy to use. If you need changes to your design you would contact your designer. If I am too busy to run the website-do you offer any additional services that would assist us in the running of our website business? At Pure-Ecommerce we are here to help you get started in the online marketplace, but we will not be responsible for running your new website for you. That is why we include our comprehensive 10-Step instructional program, as well as, include 40 hours of consulting to help you better understand how to get your new ecommerce business set up, learn the backend, add new products and market your business online. We CAN offer you a variety of a la carte SEO and Marketing Services to help you jump start your new business! Our SEO packages feature naturally written content for a specified number of pages on your website written by our team of content writers. We also utilize heading tags, edit meta tag descriptions, and create internal linking for your ecommerce business. Our Social Media Marketing packages offer you assistance with social media marketing for your new website. It is a great way to see examples of different types of postings, as well as, begin to build your social following. Our packages include both basic or advanced packages for Facebook, Twitter and Pinterest. Need additional assistance? Then review our complete list of a la carte SEO and Marketing Services to see the packages that interest you and we'll help you get started! Drop shipping is quite a simple process. Once you get an order from a customer on your Pure-Ecommerce designed website, you send it to your vendor. The customer paid for the order and the shipping when placed with your website. The vendor will then fill the order and ship it directly to your customer. The vendor charges your credit card on file. This process allows you to hold no inventory and run your business from anywhere in the world that you have a phone, computer and internet connection. How do you make money on the order? Why buy an ecommerce business from Pure-Ecommerce versus a competitor? Do they offer you references of successful clients? Provide the name of the site they owned that was highly successful? Is she or he experienced in SEO and knowledgeable of the Google Penguin and Panda updates? How many hours of one-on-one training will you receive? When you purchase a website business from Pure-Ecommerce you are not only receiving a top notch, well-designed website with sought after products, but you are also getting someone to personally mentor you through the entire process of running an ecommerce business. Pure-Ecommerce offers an award winning, well designed consulting process. In addition, we provide you with support through our blog that feeds into the back end of each client’s site, email, text message group and our eLearning Library. Can I work this business if I live in Canada? Yes, absolutely! The beauty of owning and operating an ecommerce business is it can be run from anywhere. Pure-Ecommerce work with clients located in Canada, Australia, the United Kingdom as well as, other international countries. The key is that you setup your company in your location and you comply with the business requirements in your area. Can I create additional relationships with vendors of my choosing? Of course! Pure-Ecommerce encourages our clients to continue to grow and expand their vendor list, as well as, their product collections. During the consulting process, in Step 3, we teach you how to research, contact and work with new vendors as you grow your business. We show you how to find new products and vendor without having to attend trade shows. Can I add more products to the site other than what is already listed or offered? Yes, you can certainly change out products! In Step 4, Pure-Ecommerce teaches you how to add, update and change products. Adding new products, plus finding new vendors to add to your business portfolio, is fun and great as you grow your ecommerce business! How does the 1-800 number work exactly? Will I have to get another line put in the house? Pure-Ecommerce recommends an 800 number service to you that is easy and inexpensive. The customer calls the number and receives a recorded message. The message is then emailed to you. You can listen to the message right through your computer. You then call them back when you’re ready. You don't need an extra phone line. You can call back from any phone line. What other equipment will I need? Will I need to purchase a fax machine? Is any additional software needed to run my business? A computer and printer are necessities. Some vendors you work with will ask you to fax documents, but as long as you have a scanner you will be able to save the document and send it to them via email. After purchasing the website how long will it be before it can start running and taking orders? If the site you’re interested in is completed then you can be up and taking orders in about 1-2 weeks. It really depends on how quick you can get through steps 1 & 2. Once you complete step 2 you’re ready-made! Will I have to file DBA in my current county? What other licenses will I need? During Step 1, Pure-Ecommerce will give you a complete list of everything you need to have in place to run your business. We will contact you within 48 hours after sending the Step 1 information to review any questions you may have in detail. How long will I have access to the eLearning library and your consulting services once I purchase the website? Within 24 hours, Pure-Ecommerce will send out Step 1, as well as, your access to the eLearning library. You will have access to this information for 12 months. Additional eLearning Library Access - find out more here. Hourly Consulting - find out more here. Does it matter if I use a Mac? No, you can access your internet business from any computer type. Do I need any special software to run my ecommerce business? No, everything you need is built into the admin area of your website. SEO stands for search engine optimization. Check out our explanation of what SEO is and what initial SEO services are provided with our online businesses for sale by reading our What is SEO page. Do I need to pay for SEO? Pure-Ecommerce firmly believes you can conduct your own search engine optimization. We will train you on what to do, how to do it and when to do it. It is something that will have to be done for your business to be successful. Does Pure-Ecommerce offer Mobile Marketing? Yes, mobile marketing sites are included with each of our online businesses for sale unless otherwise indicated. What is the total investment that I will need? I see your pricing list, but your recommendations with pay per click and Facebook ads, how much is advertising? How much advertising you need depends on you and how much effort you put into organic SEO. Many of our clients never have to use pay per click advertising, but they are very active on social media. Others use it just initially to help get the word out quickly about their website business. In our training, we help you to setup your first PPC campaign with Google Adwords. The budget we recommend for this is $5 per day for two weeks which comes out to around $70. Once the ad has run for two weeks you can determine at that time if you want to continue it or stop based on your results. Facebook advertising can be beneficial to building likes on your business page. You can do this for $5 per day for a week and come out with many new likes. Pay per click and Facebook advertising are not required. Does your company setup the social networking accounts? Pure-Ecommerce will setup your Twitter, Pinterest and Mail Chimp newsletter accounts for you. You will need to setup your Facebook business page as these tie into your personal accounts. We explain in our step instructions exactly how to setup these accounts. Are the vendors that are already setup on the website reputable? Have they been vetted to assure they provide a great service? We research our vendors to determine the quality of their products and their willingness to work with small business owners. Vendors are anxious to please your customers just like you are and we've found them to be more than willing to take care of any issues as they arise. How is pricing determined for your internet businesses for sale? There are a variety of factors that go into determining the price for an internet business for sale or one of our custom designed internet businesses. Pure-Ecommerce will be happy to discuss the pricing of our online businesses for sale with you or quote you a price for a custom designed internet business. There are a variety of factors that we use to establish the price of our businesses for sale. Each of these items contributes to the price of the business. To receive pricing information for any of our internet business offered, register on our site to gain instant access.